Today is the final day of the week that I snuck and took off work. Since I teach at two universities, their breaks rarely match up. One college had a break this week, so I took advantage of my substitute hours and got a sub to fill in for me so I could have the week off. Originally, I hoped to fly to visit Mom and Dad in Florida, but the price and the timing didn't cooperate. I also wanted to stay home to get some things done. My husband has been working crazy hours covering a trial, 12 to 13 hours a day many days, and I wanted to help reduce his stress. I planned to accomplish a lot more than I actually did, but I got some things done. I was especially productive on Monday and Tuesday. 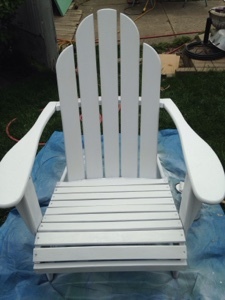 I got an Adirondack chair sanded and painted. I sanded and painted the metal chairs that go around the outdoor table. 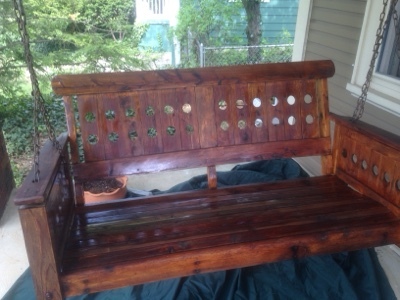 A wooden bench that sits on the front porch had gotten faded and rough. I sanded it and used spray lacquer to finish it. Finally, I sanded the porch swing and coated it in hemp oil, which my friend Sheila gave me. She refinishes furniture for a living, so she held my hand through a lot of this stuff. In addition, I also started scraping the house to get it ready for painting. I know that painting the house is one of those things that is weighing heavy on my husband's mind. I haven't made much progress, but I plan to scrape, sand and paint one section of the house at a time and I have all summer. Wednesday was fairly sedentary, after my morning run and walk. And Thursday, a sinus infection set in that left piercing pain in my face and head. I went to Writing Group anyway and my ears got stopped up too until finally, everyone's voices sounded like they were coming through a strange filter. I skipped my run this morning but walked a couple of miles instead. In addition, I had a lot of shopping to do. My husband and oldest son are headed out for a week on the Appalachian Trail on Sunday, so I bought the food they will need and also went to Eddie Bauer to get some hiking-appropriate pants for my son. Three stores and a load of laundry before I collapsed on the couch for an afternoon nap. I think I made good use of my week off, and I'm just going to bask in the things I accomplished rather than focusing on what I didn't. As I walked along the bike path this morning, watching a Great Blue Heron take flight then a long-legged egret flap his wings, a text from my daughter Grace arrived on my phone. "Is this your Bobby Hipp?" she asked and included a black and white picture. I recognized him right away, although we probably haven't seen each other in 30 years. He moved up the street from me during middle school and he became my close friend in high school. The story of his first day of school in Lebanon, Ohio, became a kind of legend that he retold to us. 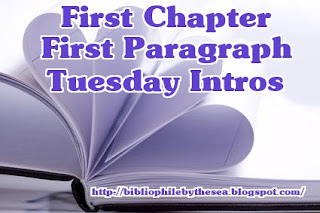 Coming from Arkansas, he had a southern drawl as he introduced himself to his teacher. "Bobby Hipp - H-I-P-P." Imagine the extra southern accent on those Ps. And that's how I told the story to my own kids about my friend Bobby. We went to prom together as friends and he planted a shy kiss against my lips as he left my door and darted toward his car. Later that day, we went canoeing as the after-prom activity. Bobby and I were both awful at it and he rowed us toward the banks where a snake dangled from a tree. I remember screaming at Bobby as we drew closer to that snake. 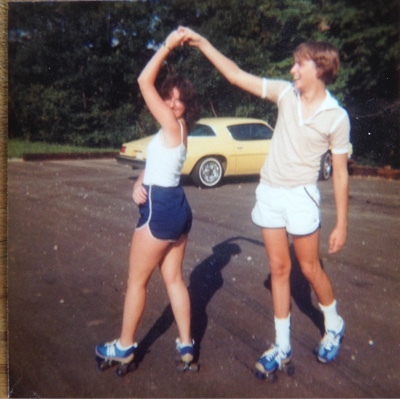 I'm not sure what prompted these roller skating photos. Maybe the Olympics had been on. 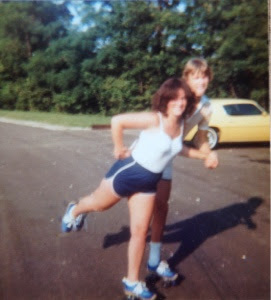 Not even rollerblades, awesome tennis shoe skates. Look at the perfect symmetry of those leg lifts! At one point, after I married a man from Columbus, Ohio, I heard that Bobby lived in Columbus. And when we moved here, I tried to find him. My husband even looked him up on the database at work before those sorts of things became easily accessible on the internet. I called the phone number that my husband found and left a voice message, but never heard back from Bobby. Once Facebook came around, I tried to find him too. I messaged several Bobby Hipps but never found my Bobby. 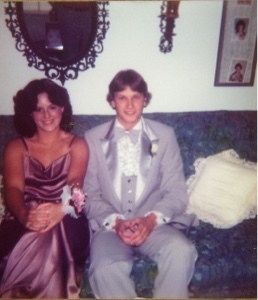 I knew, even in high school when we didn't talk about such things, that Bobby was probably gay. He had no idea if I, a small town girl, would be accepting of his life or not. Maybe it was easier for him not to connect with people from high school. Still, this morning when Grace found him, it was for all the wrong reasons. One of her theater friends had posted that she was going to his memorial service. 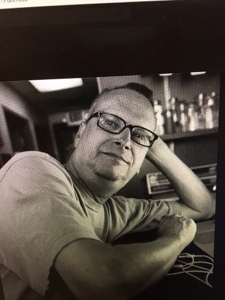 I looked him up online and found out that he died unexpectedly last week while traveling in New Zealand. I can only guess at the cause since donations were directed toward a diabetes foundation. Knowing he visited New Zealand, I was able to find him on Facebook. It turned out that he loved and visited New Zealand as often as I loved and visited France. Maybe we would have still had many things to share as adults. A feeling of love and joy and laughter wells up whenever I think of him. I wish we could have shared some times as adults. As I sit in the living room writing my blog, I can hear my husband on the front porch studying his French. He matches verbs with each pronoun -- je parle, tu parles, il parle... Je suis journaliste. He learned German in high school, so French is a whole new ballgame for him. 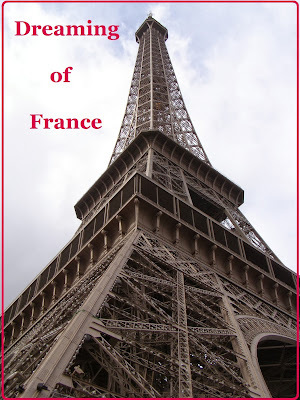 He has picked up words as we have traveled to France again and again, but the past few years he has begun to take it seriously with the realization that we will move to France next May. I joke with him that he will learn French in hardware store as he tries to find the right tool or product. But I know he wants to be able to talk people -- our neighbors, shop owners, waiters. I'm proud that he is tackling French. And, inspired by him, and by a new blog friend Roz at Our French Life, I've also been working harder at speaking French. I try to study Duolingo most days, which is a great way to learn vocabulary and the basics of French sentences. I wrote a blog post about it in September 2014. 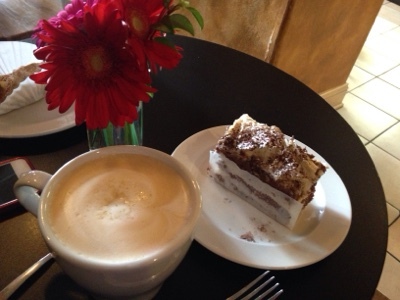 Last month, I got my nerves up and I joined a Meetup group for people who want to speak French. They met on a Friday night at a coffee shop/bar, and I spent quite a bit of time speaking French with Americans, Spanish, Brazilians, and had a headache by the time I left. I'd forgotten how much speaking another language muddles my brain. This week, there was another Meetup and I had to force myself to consider going, but I need to learn French better, especially comprehending when people speak to me. Then I noticed that the Meetup was full and a waiting list had formed. On the waiting list, I saw the name of a friend from church who has a doctorate in French. I emailed her and we agreed to meet at the restaurant and speak only in French for an hour. That was a challenge, but I know i must do it. I feel like I stumble constantly. I studied French in high school, minored in French in college and spoke fairly fluently when I stayed in France for three months as an au pair. After our hour, with my friend feeling free to correct my pronunciation or verb tense, I again felt wrung out, but I know it's necessary to improve my language skills before we move. She complimented my French and said the fact that we were able to converse for an hour meant good things about my abilities. That made me feel better. How bout you? Do you speak French or another language? How do you keep your language skills strong? I'm always looking for interesting things. 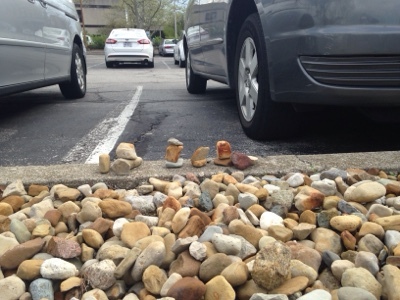 When I parked at work on Friday, I loved seeing these tiny piles of stacked stones. Apparently, they're meant to imitate cairns, which is Gaelic and the stones were balanced to memorialize loved ones. Now stacked stones might be anywhere, even in parking lots. After a sleepless night because of family worries, I cancelled my run and instead went for a walk this morning. 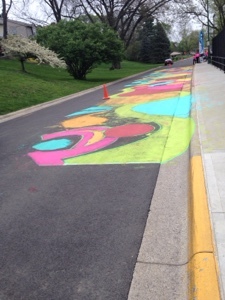 Our little city was preparing for a race with flags marking the routes, and I saw this elaborate colorful drawing. 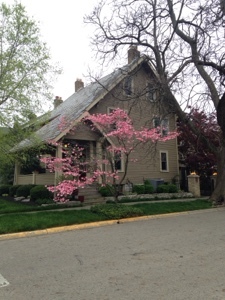 And finally, as I neared the end of my walk on this gloomy sky day, I noticed this delightfully pink tree. And I couldn't resist taking a picture. I hope everyone else is finding joy today, wherever you can. My husband and I went hiking this weekend, and it reminded me of the last time we hiked -- in France. While staying in Aix en Provence, we drove out to Mont Ste. Victoire. From far away, it looks like a massive, imposing rock. Up close, it looks even more intimidating. who were trail running from rock to rock up and down the mountain. This lake reflecting the mountain felt peaceful and cool as we began the ascent. seemed to get farther and farther away as we climbed. Here's a shot of my husband hiking up the mountain ahead of me. The trail became much more treacherous as we scrambled up rocks. We never reached the top, but that's my fault. I wimped out. Nice view though. Definitely worth the hike. I'll try again another time. Thanks for playing along with Dreaming of France. I really appreciate your participation and I hope you'll leave a comment plus visit each other's blogs. 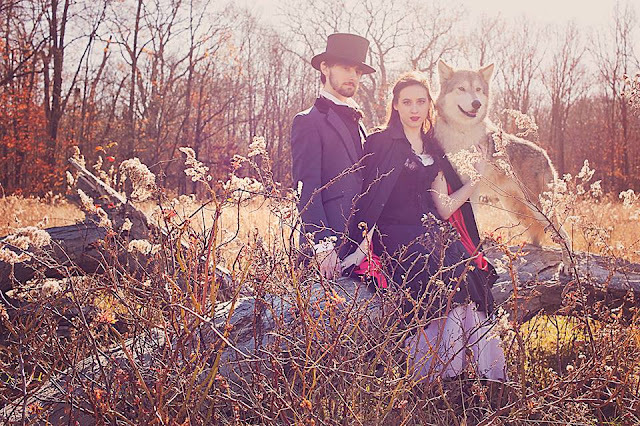 How is it possible that I never wrote about Grace's picture shoot with a wolf? I searched my blog history and couldn't find it. 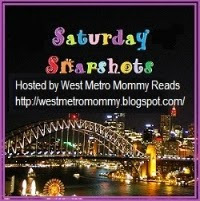 I think sometimes I share a post on Facebook and think I included it on my blog. 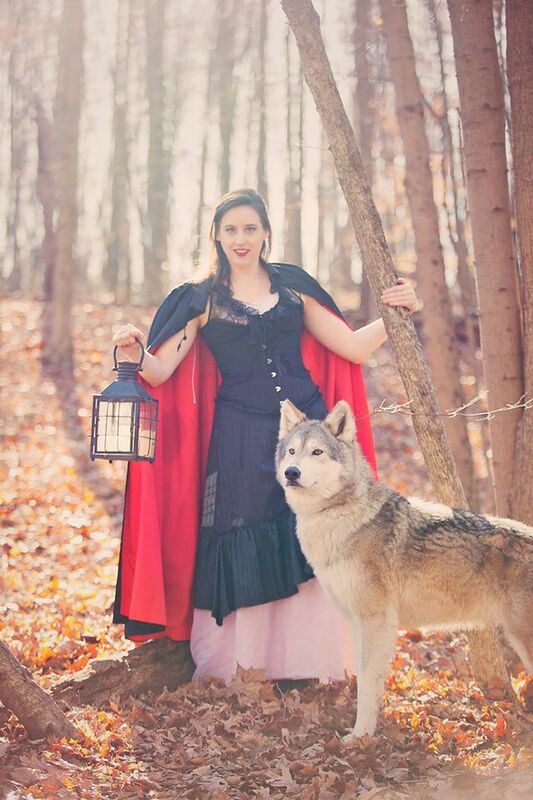 Last fall, one of Grace's photographer friends wanted to do a photo shoot with a wolf rescue foundation. Grace, her boyfriend Jack, and two of their other friends dressed up in Victorian clothes and showed up to pose. You can see that the wolf was fairly tame. Here are Grace and Jack posing with the wolf. That wolf must be used to having his picture taken cause he knows how to strike a pose. Of course, Grace and Jack look good too. Grace's eyes are very intense in this picture and the next one too. Here, Little Red Riding Hood has no fear of the wolf. I'm sure they're both out looking for Grandma. I decided to share this post after reading a blog post by Corey at Tongue in Cheek. She wrote about how she is overcoming her fear of dogs -- slowly. I saw this story on someone's Facebook page, then realized it was a year old. Whether it happened last month or last year, though, it's still worth sharing. 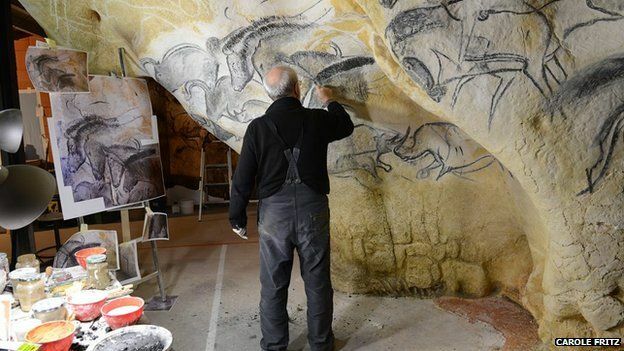 The BBC did a story on cave paintings that were discovered 20 years ago in Chauvet, France. It's northwest of Avignon and not too far from the area we plan to move next year. The paintings are perfectly preserved and give a glimpse into a life that we can only imagine or read about. Scientists want to share the cave paintings with everyone, but they fear that the paintings will be contaminated and ruined by crowds of people flocking to the caves. So they have recreated the paintings in a nearby concrete building. Although not quite the same as viewing the real thing, I'm looking forward to seeing the recreation in France some day. 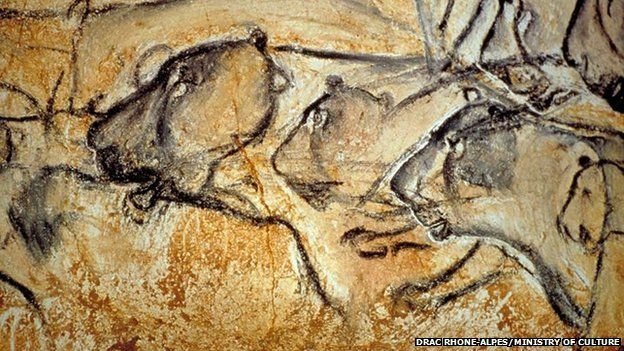 Here's the BBC video on the paintings in Chauvet. 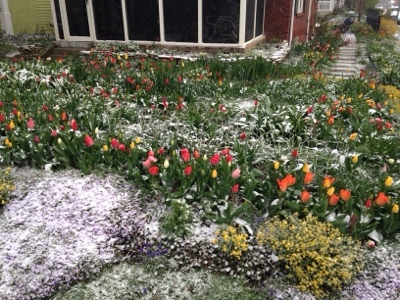 We woke up this morning to find that Spring has abandoned us and winter returned in full force. I tried to go for a run but stinging nettles of icy pellets attacked my face, so I came home. 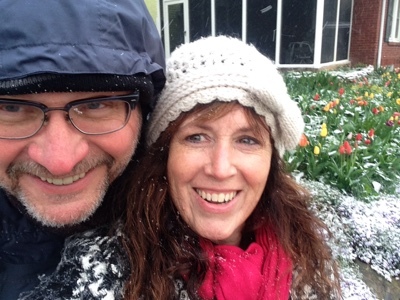 My husband agreed to go for a walk with me, so we could be bundled up. The weather continued to be cold and blustery, but we paused to take some pictures of the snow on the freshly bloomed flowers. We also took a tulip selfie. This woman always has gorgeous tulips every spring. It feels like Holland. 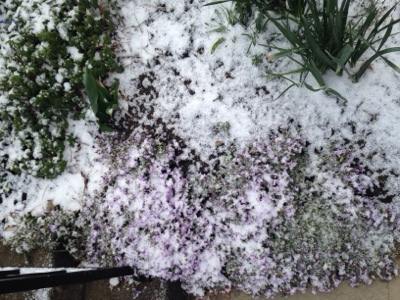 The snow also looked picturesque on the creeping phlox. The weather should return to the Spring later this week. Hope you're having a lovely weekend, bad weather or no. I read Sally Christie's first novel in this series, The Sisters of Versailles, and it gave me a ring-side seat into life at Versailles under King Louis XV. This second book though, The Rivals of Versailles, plunged me straight into the intrigue of the King's most famous mistress, Madame Pompadour. I really enjoyed this book and had trouble setting it aside for mundane things like work and cooking dinner for my family. Maybe it helps that I didn't know the book was about Madame Pompadour. At the beginning, she was just Jeanne-Antoinette Poisson, a middle-class girl at a fair when a fortune-teller predicted that she would some day be the mistress of the king. After that, her entire childhood was spent preparing her for that role. Like any good historical fiction, the details are exquisite and the reader is swept into the halls of Versailles where women jockey for the king's favor and men use the women like pawns on a chess board to gain the ear of the king. Jeanne must even resist the king's advances to make sure she can enter Versailles as his mistress rather than just another girl in the string of lovers pleasing the king. And the entire court is appalled that a non-royal woman becomes so powerful. I won't give away the rest of the story, which some of you might know if you've studied history, but I guarantee that you haven't seen it from this light before. I wait. And wait. Clouds threaten and an insistent breeze heralds a coming storm. It must not rain. It must not. Please, God. My nerves are frayed as the wind whips the ribbons on my hat. Please, no rain. Then the sound of hooves to mimic the pounding of my heart. Binet canters out of the forest, followed by another man. That it is the king I have no doubt: his face is at once both wonderful and familiar. "Sire, might I introduce you? The Comtesse d'Etoilles." "Madame d'Etiolles," says the king, bringing his horse up alongside my chaise. "So, Binet, this is the doe you thought had come this way." His voice is low and husky, the tone amused. "Delightful." "Indeed, Sire, this is the lady that is enchanting Paris, as well as these forests." "And I can see why. A singular beauty," murmurs the king, looking at me with intense dark eyes. I am staring at him with an openmouthed gape. The face I gazed upon constantly...he is even more handsome than his portrait." I enjoyed this novel even more than the first and will give it five stars on Amazon and Goodreads. 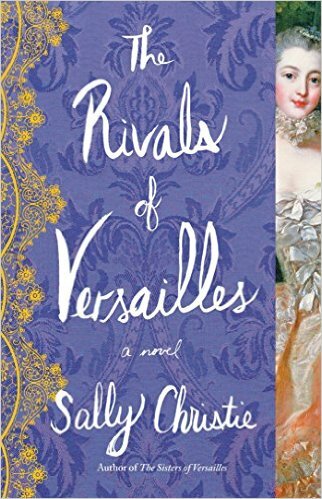 In this scandalous follow-up to Sally Christie’s clever and absorbing debut, we meet none other than the Marquise de Pompadour, one of the greatest beauties of her generation and the first bourgeois mistress ever to grace the hallowed halls of Versailles. The year is 1745. Marie-Anne, the youngest of the infamous Nesle sisters and King Louis XV’s most beloved mistress, is gone, making room for the next Royal Favorite. Enter Jeanne-Antoinette Poisson, a stunningly beautiful girl from the middle classes. Fifteen years prior, a fortune teller had mapped out young Jeanne’s destiny: she would become the lover of a king and the most powerful woman in the land. 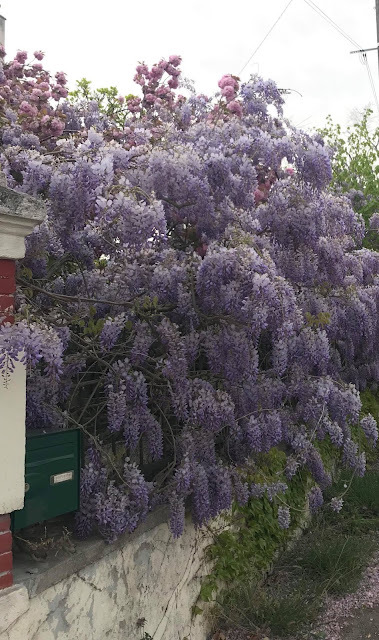 Eventually connections, luck, and a little scheming pave her way to Versailles and into the King’s arms. All too soon, conniving politicians and hopeful beauties seek to replace the bourgeois interloper with a more suitable mistress. As Jeanne, now the Marquise de Pompadour, takes on her many rivals—including a lustful lady-in-waiting; a precocious fourteen-year-old prostitute, and even a cousin of the notorious Nesle sisters—she helps the king give himself over to a life of luxury and depravity. Around them, war rages, discontent grows, and France inches ever closer to the Revolution. Enigmatic beauty, social climber, actress, trendsetter, patron of the arts, spendthrift, whoremonger, friend, lover, foe. History books may say many things about the famous Marquise de Pompadour, but one thing is clear: for almost twenty years, she ruled France and the King’s heart. Visit each blogger on the tour: tweeting about the giveaway everyday of the Tour will give you 5 extra entries each time! [just follow the directions on the entry-form] Global giveaway open to US residents only: 5 participants will each win a print copy of this book. boyfriend on her birthday so she goes to stay with a friend in Paris. 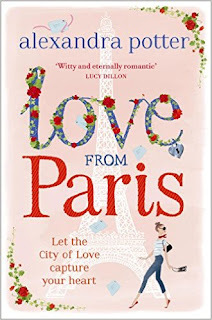 This book is definitely chick lit, which I enjoy many times. I'm a little worried because the next step is the friend in Paris representing an apartment that has been untouched for 60 years, which is what The Paris Apartment was about. This is obviously a different take on it. Hope you're reading something fun.